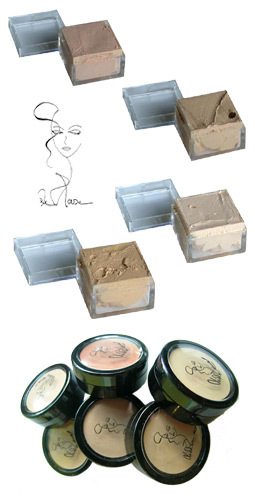 CUBED CREAM CONCEALERS coordinate with the Liquid bases. I use this concealer alone on people with almost perfect skin to correct small blemishes and under eye circles. If you use a slightly lighter concealer than your base make sure to blend a little of your base over the concealer to make it more natural looking. We custom blend these concealers at our store location. Tip: To blend perfectly, use the synthetic concealer brush, then using the large eye shadow brush press the translucent powder gently onto the concealer to give it staying power. For those with very pale skin, using the Water concealer, you will probably need to use a little White powder before applying translucent powder. Click here for brushes.